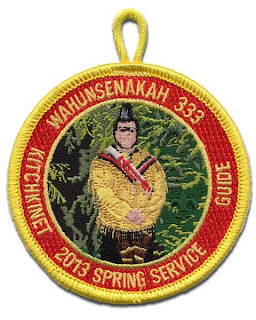 Wahunsenakah Lodge held their Spring Service weekend May 17-19 at Bayport Scout Reservation, and issued the patch pictured above, a 3 inch solid embroidered round pocket patch featuring the Guide Kichkinet. Wahunsenakah Lodge recently issued two new metal flaps, each manufactured by the Witch Trail Committee of Mansfield, MA who also made the first Lodge belt buckle. 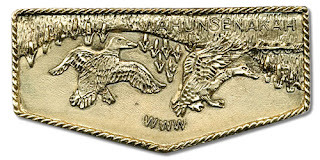 Like the buckle, the new M2 and M3 metal flaps are replicas of the S2 service flap. The metal flaps were available via preorder at a cost of $15 for the pewter M2 and $20 for the M3 which features a gold wash finish (see above). Both can be purchased by any member of the Lodge, but the M3 is only authorized for wear by youth members of the Lodge Executive Committee. The manufacturer inadvertently omitted the fleur-de-lis from these versions, and a corrected reorder is planned for later this spring.